There is always a whipping boy. I believe Drew taught me that. 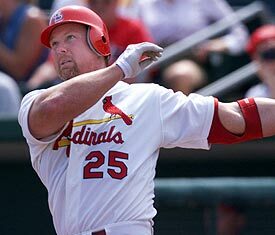 While JD was in St. Louis, he hit .282 with 96 home runs and 280 RBI. He had a 5.5 WAR season and never failed to put up at least 2.5 WAR. Yet, no matter what he did, it never seemed to be good enough for a portion of the fan base. He was injured, true. At times he seemed to be more often on the bench hurt or on the DL than on the field. However, at least one of those injuries was a broken wrist due to being hit by a David Wells fastball. The Cardinals also often let their players heal up on the bench, saying it’d be a day or two before it turned into an eventual DL stint. While perhaps some of that in Drew’s case was his fault, some of it may not have been. Either way, it made fans aggravated to see him sitting instead of hitting. Of course, expectations played a large role in this as well. Drew was supposed to be the next big thing. He’d been a top draft pick that shunned the Phillies, then signed with the Cards the next year after being drafted. He tore through the minors (I actually saw him at AA Arkansas in ’98, when he stole his first professional base) and made his debut a couple of innings after Mark McGwire launched #62. 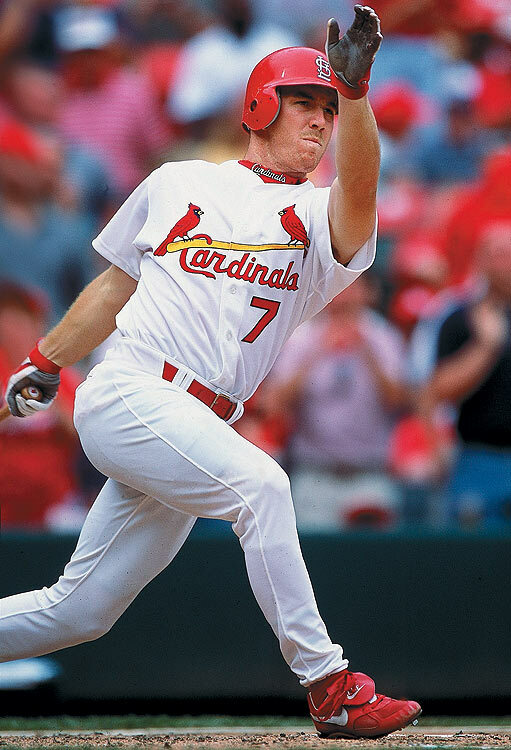 Coupled with the phenom that was Rick Ankiel, this was the one-two punch that was going to put St. Louis back in the World Series. It didn’t work like that and folks took their frustration out on the man that seemed not to care. You didn’t see Drew getting mad when he struck out and he glided after balls as if he was running half-speed. Even Tony La Russa felt that Drew was coasting on his talent. I wouldn’t want to argue with a man like TLR, especially since he was there every day, but sometimes the fans want to see a little demonstrative behavior. When Drew left, Colby Rasmus soon became the next whipping boy. There’s always someone, though it’s usually a position player rather than a pitcher. (Though Jaime Garcia comes in for a lot as well.) Sometimes it could be deserved, like when Pete Kozma and Peter Bourjos have gotten lit up. Sometimes, probably most of the time, it’s really not. No matter, there will always be someone on the roster that gets a disproportionate sliver of blame when things go wrong. Side note: when looking into the players for today, I noticed Joe Medwick and wondered why his number hadn’t been retired by the Cardinals yet. After all, Medwick is a Hall of Famer and built that career mainly in St. Louis. He’s the last National League player to garner a Triple Crown, for instance. Derrick Goold, as is his wont, let me know that it was mainly an oversight but the Cards aren’t planning to correct it any time soon. Perhaps sometime after Holliday takes it off they’ll consider it. While I’m not necessarily one to push for another number up there (which would leave very few single digits available, even fewer if 4 and 5 ever are taken permanently out of circulation), honoring Medwick wouldn’t be a terrible move for the club. And it’s one way to acknowledge there’s always a whipping boy.